At the end of last summer, my wife and I were invited to have dinner with our friends, Ben and Julia at their house. We never refuse an invitation from them. For one, they are very close, longtime friends. Secondly, they are both fantastic cooks. When we arrived at their house, there was an absence of delicious aroma coming from the kitchen. "Are we too early?” I asked. “Not at all,” replied Julia. “Follow me” she said, as she led me through the house to the backyard. To my surprise, there was Ben cooking in their new outdoor kitchen. “When did you install this?” I asked. “I was just here last weekend when I dropped off my stone grinder, and I don’t remember seeing an outdoor kitchen,” I declared. “We had it installed during the week,” said Ben. I wasn’t entirely surprised that Ben and Julia’s new outdoor kitchen had been installed so quickly and easily. 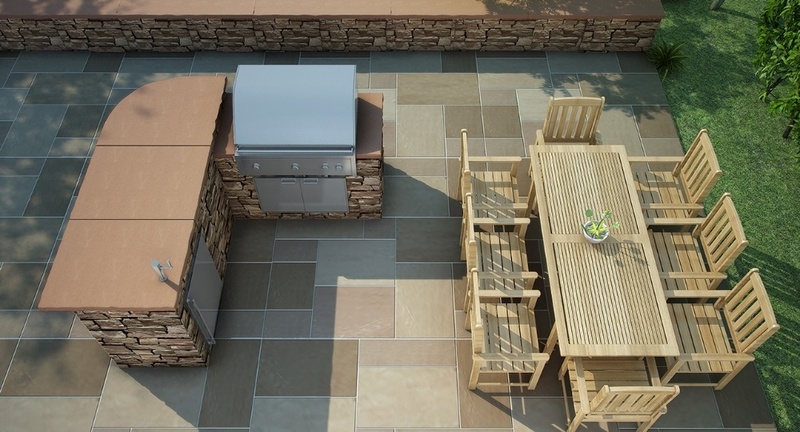 Building an outdoor kitchen for homeowners has never been easier. Companies like Eldorado have complete lines of pre-configured, precast concrete outdoor kitchen cabinet sets (signature kitchens). If you would like to configure your own custom layout, Eldorado also has a complete line of precast concrete outdoor kitchen cabinets that you can arrange virtually any way you choose. They also have a number of accessories such as vents, backsplashes, appliance brackets, and even precast concrete sitting walls. Building an outdoor kitchen in the traditional way, with concrete masonry unit block (CMU block), takes an inordinate amount of time, money and resources. With prefab outdoor kitchen kits, you can create a beautiful and authentic outdoor masonry space for your yard in less than half the time compared to traditional building techniques. First, the area where the outdoor kitchen is going to be installed needs to be chosen. Any gas, electrical, water, and drainage needs to be installed. A 4 inch concrete or paver foundation is the minimum that is required to place the outdoor kitchen cabinets on. Once the planning steps are completed, the installation of precast concrete cabinets takes only a day or two with a couple of people. A custom-built outdoor kitchen cabinet system can take as long as a week to put together. To install the precast concrete cabinets, place the cabinets in their designated area. Make sure they are level (use shims if necessary). Then glue the sides that will go together, place the bolts in the predrilled holes, and tighten the bolts. Use a 4 inch diamond blade to cut out the sections for the appliances, doors, and drawers. Install all the appliances, doors, drawers, and countertops. Good outdoor countertop material choices include tile or granite. Finally, apply the stone veneer of your choice or have a mason apply it for you. Eldorado outdoor kitchen cabinets come with a one year limited warranty. Eldorado has five outdoor signature kitchen cabinet sets and a number of individual outdoor kitchen cabinets that can be arranged to form an outdoor kitchen in any size desired. Prefab outdoor kitchen kits are a great way to bring your living space to your backward, increase the value of your property, and create a fun environment for family and friends to convene. Want more great ideas for your yard?